Internet; Political aspects; United States. Political participation; Technological innovations; United States. Communication in politics; Technological innovations; United States. Amazon.com description: Product Description: Online social media are changing the face of politics in the United States. Beginning with a strong theoretical foundation grounded in political, communications and psychology literature, Tweeting to Power examines the effect of online social media on how people come to learn, understand and engage in politics. Gainous and Wagner propose that platforms such as Facebook and Twitter offer the opportunity for a new information flow that is no longer being structured and limited by the popular media. Television and newspapers, which were traditionally the sole or primary gatekeeper, can no longer limit or govern what information is exchanged. By lowering the cost of both supplying the information and obtaining it, social networking applications have recreated how, when and where people are informed. To establish this premise, Gainous and Wagner analyze multiple datasets, quantitative and qualitative, exploring and measuring the use of social media by voters and citizens as well as the strategies and approaches adopted by politicians and elected officials. They illustrate how these new and growing online communities are new forums for the exchange of information that is governed by relationships formed and maintained outside traditional media. Using empirical measures, they prove both how candidates utilize Twitter to shape the information voters rely upon and how effective this effort was at garnering votes in the 2010 congressional elections. 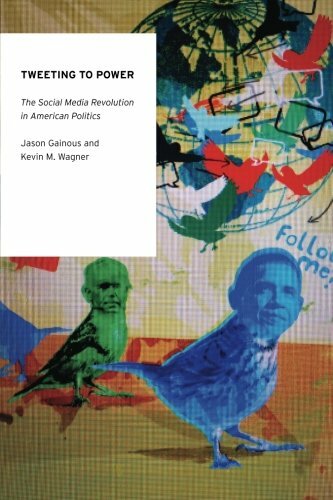 With both theory and data, Gainous and Wagner show how the social media revolution is creating a new paradigm for political communication and shifting the very foundation of the political process. About: Online social media are changing the face of politics in the United States.